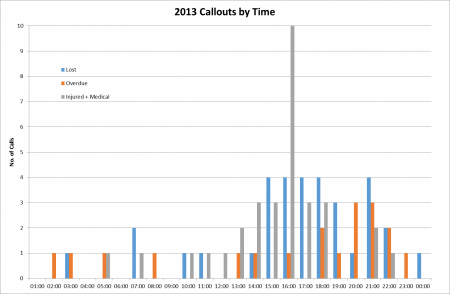 By recent standards 2013 was an average one for the team with 108 ‘999’ calls. 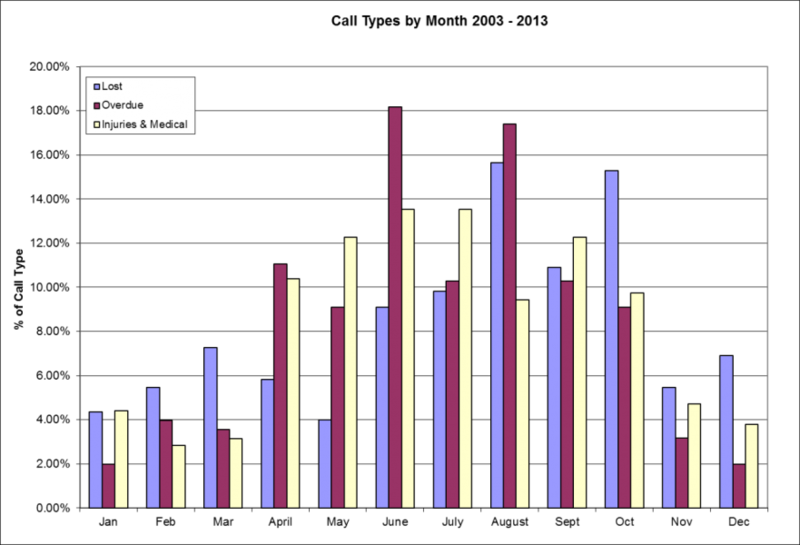 This review considers the 2013 statistics, both for the year as a whole and in the wider context of the past 10 years. In total 1028 incidents are included in the review. The presentation of data and definitions used is the same as that previously published on the team website in the review of calls between 2003 – 2011 and 2012. These are repeated at the end of this article. 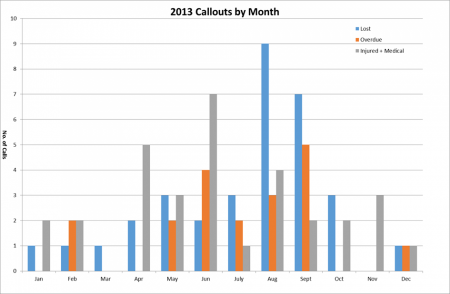 The graph above shows that deployments on the fell for full or limited callouts remain relatively constant over the past 3 years, the variable component being the alerts. 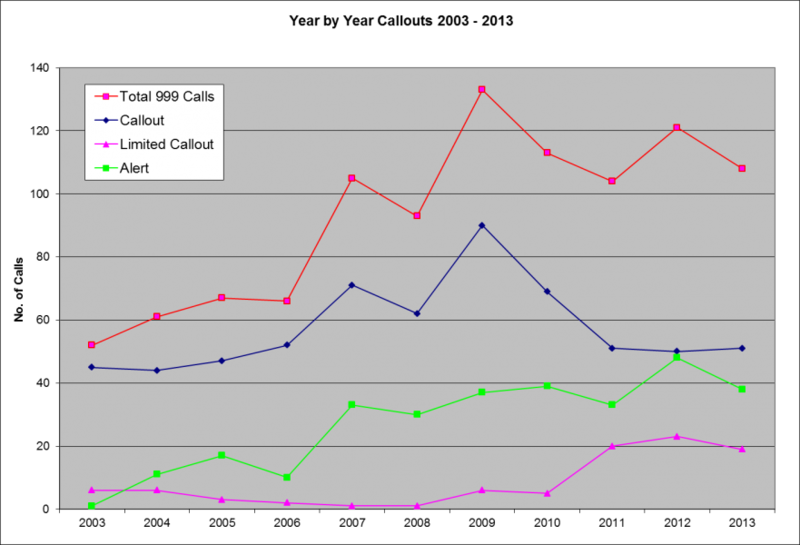 Over the past 10 years, full team calls have arguably returned closer to previous levels, what has increased are the alerts and limited calls. The PIE chart below shows a breakdown of the 2013 incidents by type. Once again Lost was the most common reason for calling at just under 31 %. What is slightly different for 2013 is the reduction in reports of overdue compared with previous years, balanced by an increase in Cragfast and Other. Looking at the last 10 years Lost has been on a steady upward trend whilst arguably Overdue is declining. 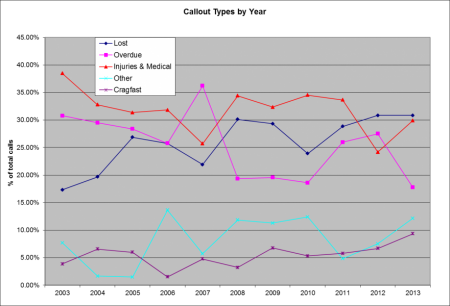 Injuries / Medical has remained relatively constant as a %, although as the total numbers are going up so are the absolute numbers of injured / medical. 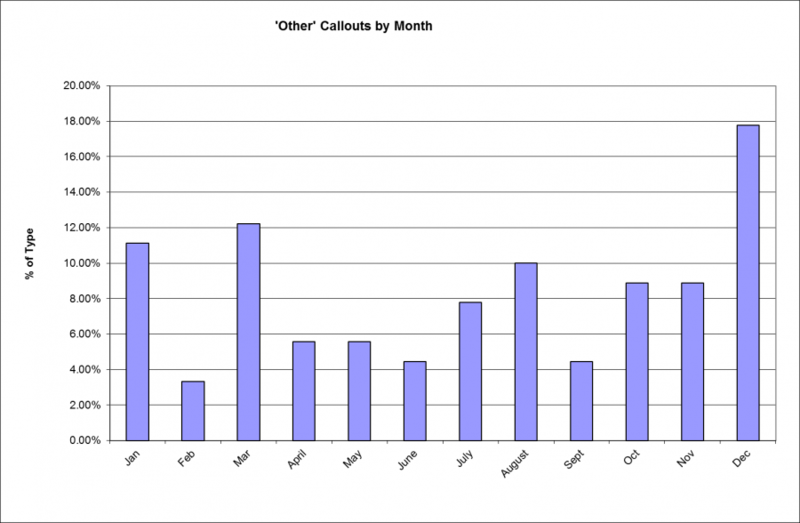 The plots below show the breakdown of calls by month of the year for 2013 and for the past 10 years as a whole. 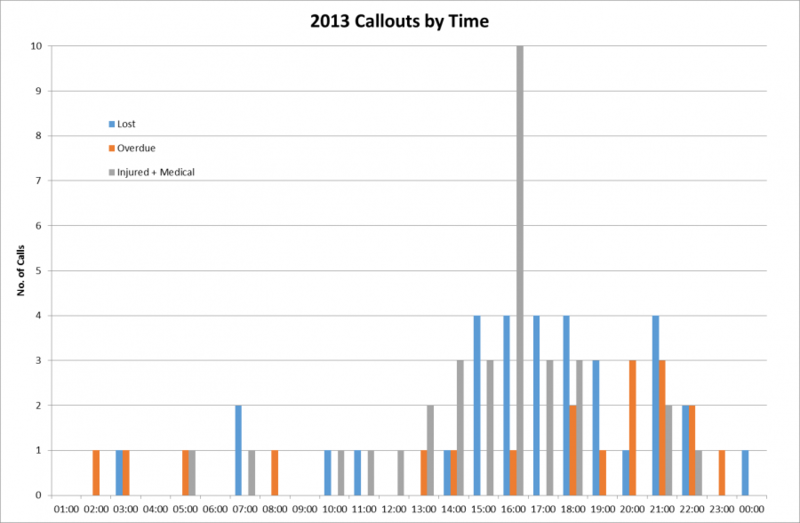 The breakdown of calls by time of day is shown below, both for 2013 and the past 10 years as a whole. 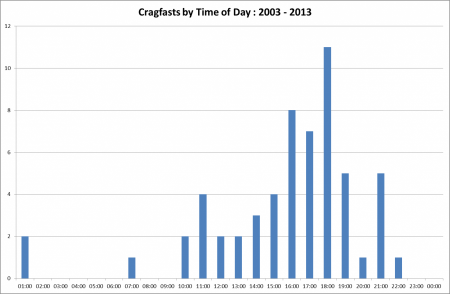 The x-axis is the highest value of each data �����bin’, ie : 13:00 is all times from 12:01 – 13:00 and so on. The spread of Cragfasts over the past 10 years is shown below by month and time of day. 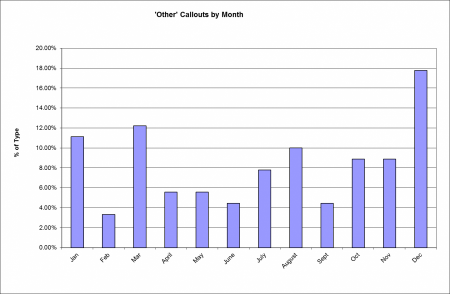 Finally, the figure below shows the distribution of Other calls from 2003 – 2013 by month. As described earlier, the long term trend over 10 years has been an increase in number of calls received, almost doubling over the period, however, full callouts have not increased to the same extent with many calls handled without a response on the fell or a small group resolving the situation. As a % injuries and medical issues remain fairly constant, the main growth has been in Lost, people reporting themselves stuck on the fell using a mobile phone. In contrast, Overdues are on an apparently downward trend, potentially those who were reported as overdue in the past are self reporting earlier? 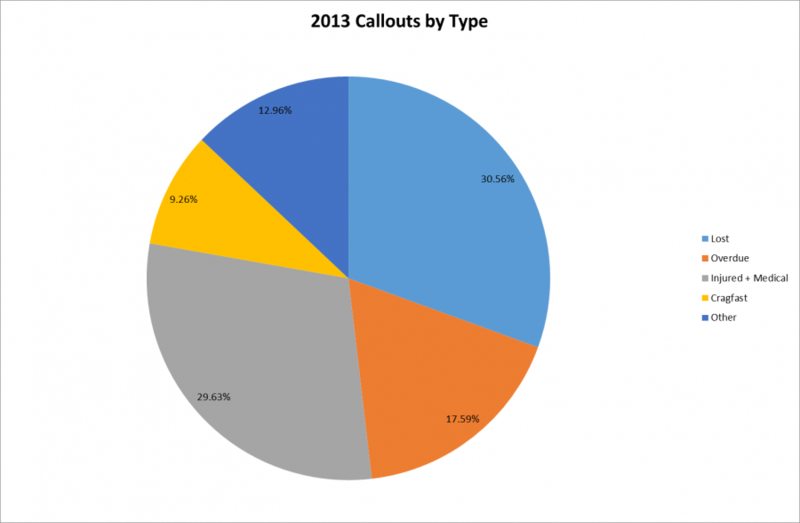 In terms of callouts by month, 2013 was unusual in a couple of respects. There was a prolonged late winter from March – May with snow lying on the high fells beyond May Day bank holiday. This led to a rush of ‘Other’ calls in March helping with the snow drifts but also meant the hills were quiet over Easter and into April, before the 3 peaks season started in June. July was particularly hot and again the hills relatively quiet. 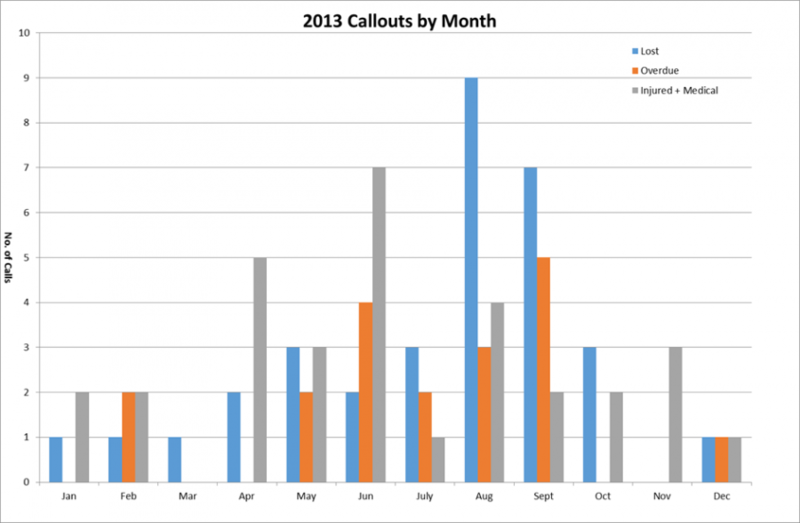 This was followed by bad weather through August and a notable increase in calls, particularly Losts. The 10 year trend on callout time is for the majority of Injuries to occur from 13:00 – 18:00, Losts from 16:00 – 21:00 and Overdues 18:00 – 00:00. 2013 was consistent with this, the main feature being that a large number of the injuries all occurred from 15:00 – 16:00. 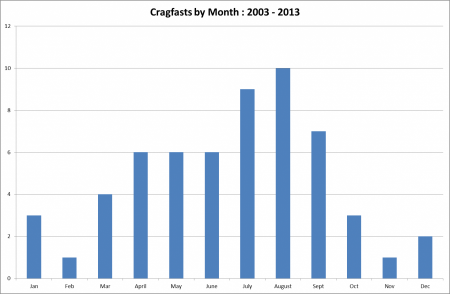 There are too few cragfasts in a given year for detailed analysis but over 10 years the pattern emerges that these types of calls are most likely in the summer months, particularly July & August and most likely to occur between 16:00 – 19:00. 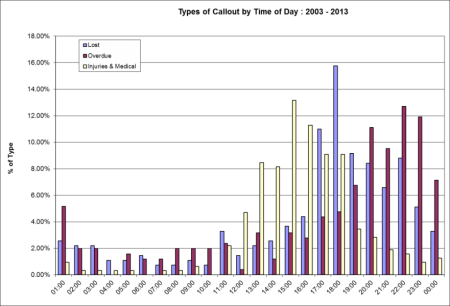 The distribution bears some similarity to the distribution of Losts. 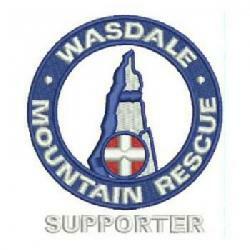 2013 did feature a number of cragfast / stuck incidents on the Wasdale Screes where people underestimated the difficulties. A new guidance section on the Screes has been posted on our website under ‘Black Spots��� to hopefully provide further advice. Others include non-mountain incidents, such as snow / cars stuck on ice, flooding, urban searches and false alarms. As shown in the figure, these tend to occur most in the winter months as would be expected. The 2012 review highlighted the increase in alerts and explained how an increase in mobile phone calls for Losts was being offset by other technical developments such as Sarloc allowing relatively simple calls to be handled by the team leader without a significant response on the hill. This trend continued in 2013. Perhaps what does come out of the statistics this year is the potential effect of significant weather, either hot or cold and the impact it has on numbers on the hill. Anyone visiting Wasdale in mid-July would have seen lots of picnics by Wast Water then had a relatively quiet walk on the hills. On return to more normal (and wet) conditions in August the calls started again. It might also be thought that snow & ice make the hills dangerous. No data for total hill goers are presented to allow proper comparison but purely based on Wasdale callouts the trend is for less total calls when there is snow and ice on the fells.